As Christmas approaches, I felt it would be terribly tardy of me not to give Beeston’s favourite magpies a bit of a shout out. Since opening their decorative doors in April 2016, Two Little Magpies up at Broadgate Shops have been serving us up a delightful selection of handmade crafts and original artworks supplied by local creatives. But that’s not the only reason we love them so much. Because of Lucy’s fondness for Beeston and the wonderful characters within it, Creatives Beeston’s Bee Creative project has been allowed to thrive and develop into the hugely successful community project it has now become. 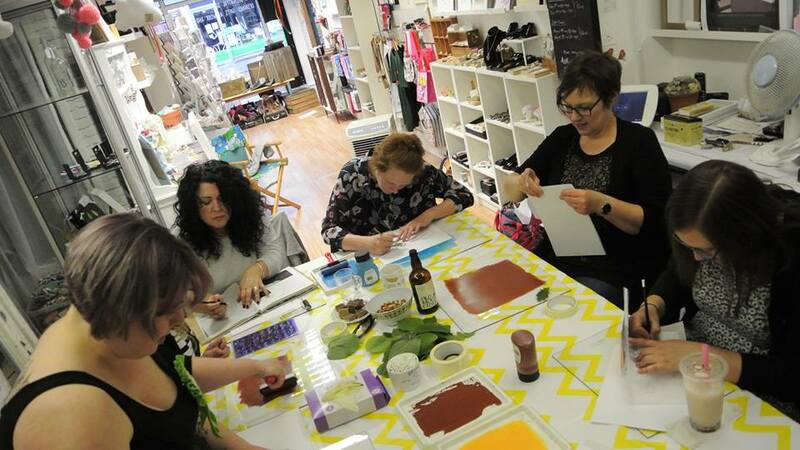 Homeless, after The Candela Shop closed down in January 2016, the Bee Creative team were looking for a space to spend one evening a month indulging in a bit of craft therapy. We had some great evenings in the White Lion, Refan and The Star Inn, all of whom made us very welcome, but lacked the security and consistency that a regular spot could provide. Loyal followers turned up eagerly but it was difficult to reach the people that were less confident to arrive in random places on an ad hoc monthly basis. As soon as I met Lucy, she was keen to consider offering her shiny new studio space to us for our monthly craft sessions. She even suggested she arranged the first one for us, seemingly delighted at the chance to test-drive the studio. There was no charge but we set up a donation scheme so that she wasn’t out of pocket and this worked really well. People were as generous with their cash as Lucy was with her time and resources and we had a surplus by Christmas. We used the pot of money to provide refreshments and materials for a Mind Crafternoon, where donations were collected for the charity, and put together a pamper evening with fizz, nibbles and free craft activities as well as an opportunity for subsidised massage therapy. Bee Creative moved to bigger premises this June, we are now at Middle Street Resource Centre, where between eight to twenty people gather every Monday night to create, de-stress and generally spend a couple of hours in the company of a great bunch of supportive people. During the two-hour sessions they are taught useful craft skills that we build on each week and they generally go home with something they are proud of. Our collaboration with Two Little Magpies continues though. One of the original members of the craft group now works at the shop and has designed our new Creative Beeston logo, which will be revealed in the new year. And you can expect to see them joining forces next year in creating some community events. Two Little Magpies have since put together a comprehensive selection of fabulous workshops of their own that are proving very popular with the locals. As well as the instructed workshops in which you can craft some paper flowers or stitch yourself a Dorset button, Lucy has set up a few ‘drop-in’ nights where you rock up with your own projects for a bit of ‘Stitch and Chat’ or more amusingly ‘Smutty Stitch!’ The latter session is described as ‘not for the faint hearted’ and unsurprisingly the next one is fully booked! Who knew Beeston was full of such filthy folk?! If like me, you love the independents in your town then please remember to shop local this Christmas. Leave the mass-produced tat on the shelf and buy something lovingly handmade from one of our many creatives. I don’t know about you, but it feels a lot better to know that your money is staying in the local economy and is more than likely sustaining one of the families in your community. What can be more wholesome than that? I wanted to start this piece with a mysterious journey but a few stops on the IGO didn’t quite fit the bill, although being pensioners’ shopping day it did feel a little bit like a ghost train. I was also pleasantly surprised to find that Long Eaton wasn’t the zombie apocalypse I had been warned about when I alighted at The Green. I was however on the search for none other than the heavily tattooed gentleman whose resemblance to a flat capped Vic Reeves is more than a little uncanny. If you cross over on Wilko’s corner and saunter down Oxford Road, tucked away in Mayfair Walk you will find a hidden talent who grew up on Imperial Road in Beeston. Daniel Roberts has been filling up sketch books from his wild imagination since he was a nipper and the manifestations from his mind are now finding themselves adorning the bodies of many local characters. Danny opened his tattoo parlour ‘Paperhaus Tattoo’ back in 2014 after completing a three-year apprenticeship. He is not entirely sure what inspired him to tattoo in the first place other than the simple desire to ‘see his artwork on skin.’ The inspiration for his often dark characters and twisted scenes are born out of a desire to make the ordinary extraordinary, after all why wouldn’t a horse wear a pair of high heels and a rabbit be partial to eating a sandwich? 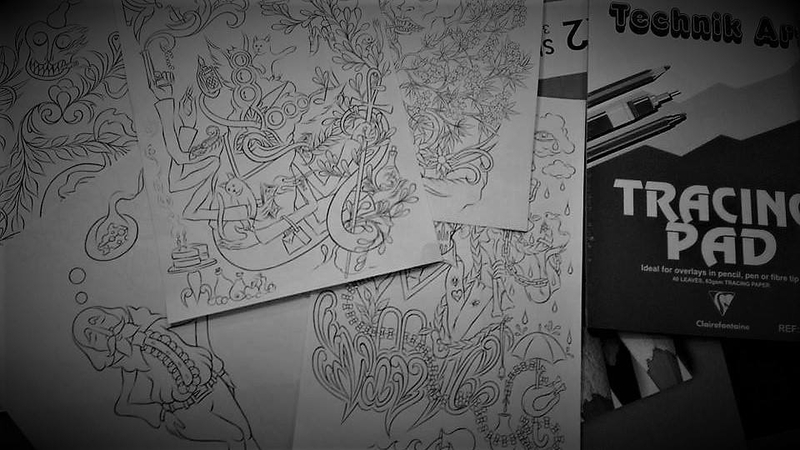 He considers himself as an artist who tattoos, his artwork did come first after all. Some of his designs are currently available on t-shirts and will soon be available as prints. When I arrived at his studio for a chat and a strong coffee, Danny was working on a piece for guy in Phoenix Arizona that he had hooked up with via Instagram. He was clearly thrilled that this guy had lots of positive things to say about his art but it was their shared love of vinyl that led to this commissioned piece. The design will be printed up on t-shirts to promote a local club night at a tiki-themed bar, a real ‘by the people for the people’ kind of design project. ‘ Afro Waltz’ by John Cameron was playing in the background as he spoke which made for a relaxed if trippy atmosphere. As I watch intently as his busy digits sketch, I ask him how he comes up with some of his detailed designs. He picks up his comical coffee mug, in a jaunty fashion, and tells me ‘I clear my mind and it’s like a cosmic internet connection, it’s automatic how things connect and I often look at what I have drawn and ask myself “How did I think of that?” He talks about the urge to draw as that familiar ‘itch you have to scratch’ and likens his inspiration to childhood pastimes like seeing shapes in the clouds or in patterns on the pavements. He says he has been influenced by the works of Dali and Woodring and there is most definitely surrealism in his art. There are also recurring symbols that appear in many of his drawings, a favourite being the oven ready chicken, which has been spotted in some very compromising positions. It is the reactions to his work that Danny enjoys the most. Whether they shock, excite, humour or disgust he doesn’t mind as long as they get a response. It would be fair to say there is an innocence and sense of mischief in a lot of his works and this is quite representative of the man himself. He has most certainly got his own style and he recognises that it is not to everyone’s taste and could be considered niche.